Many owners believe their pets can sense stress or emotions. 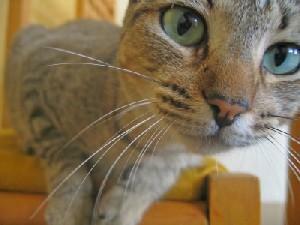 Here, our visitors ask questions related to whether or not cats can sense stress. I have a one-year-old cat named Todd. He has had a huge change in his personality in just one week's time. He eats just fine and everything, but he now will whine when I leave the room. I've extended the time I've paid attention to him, though I have been going doctor to doctor. Each time I go out the door to go to one of the doctors, he'll run out and try to jump in my arms. This change kind of scares me. He's a very friendly cat, but never to the point where he has to stay glued to my side. It now breaks my heart to leave him. Could he maybe be seeing that I'm in pain, and stressed out, and responding in his own way? I think a couple of things are going on here. First, I think he probably is sensing some of your stress. I'm not sure what you're going through, but I'm sorry that you have to deal with it right now and I'm glad that you have Todd there to love and comfort you. Did you know that they've done studies about the healing power of pets? You can read about the therapeutic value of animals at Dr. Martin Williams' Website. The other thing could be that he is sensing the change in routine, because of the many doctor appointments. Cats become creatures of habit and do not like any sort of change. He may just be feeling uncertain about what is happening. Keep giving him extra attention and enjoy that your cat likes to cuddle. He'll likely settle down as your world grows less stressful.